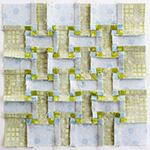 Have you seen that Katy is hosting a hexalong on her blog? She has posted a few tutorials on how to get started. She is such an enabler that I decided to play with some hexagons too. Katy's pattern calls for 1.5 inch (measured on one flat side) hexagons. I like the look of the 1 inch ones so I'm using those. It also helps that I already had 1 inch papers. The other night I emptied the scrap bin and cut hexagons in groups of six. I just held the paper template to the front of the fabric and cut a hexagon with quarter inch seam allowance with my scissors. 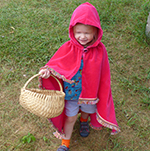 Some pieces of fabric were large enough that I could fold cut six at a time with my sharp Ginghers. The Kona sample pack of the new colors I got at Quilt Market was perfect for the centers. I was also compelled to try some hexies in the 1/2 inch size. They are so cute. I don't think I'll be making a whole quilt from them but they will be fun for smaller projects. 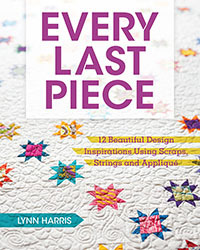 For those of you who are not familiar with English Paper Piecing, it is a traditional method for hand piecing quilts. The fabric is basted around a paper foundation and held to shape by the paper so that the pieces can then be sewn to each other. Some people use glue or a fabric glue stick to baste the fabric to the paper foundation. 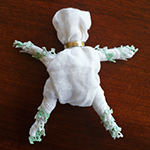 I prefer to thread and baste them without stitching through the papers. This way the basting can stay in after the papers are removed. 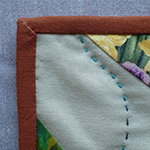 The basting stitches will keep the seam allowances in place until the quilt is put together with the backing. Here's a picture of one that I have basted. I take two stitches to start - the second stitch traps the thread tail and keeps it tucked toward the center. Then, since I'm left handed I proceed counter clockwise turning down the seam allowance and taking one tiny stitch to hold the fold together. On the last corner I take two stiches so that I can again trap the thread tail. This method is pretty quick. The next step is to stitch them together into flower shapes. They could be sewn together in any sort of pattern but I'm making flowers for this project. 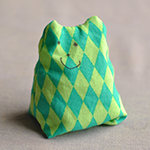 I'm getting a bunch of these ready and put in a bag for portable sewing. It'll be a great project for the car.